Interest Rates are Rising--Where Are They Going? Posted by Jonathan Kostyra on Friday, September 20th, 2013 at 4:39pm. 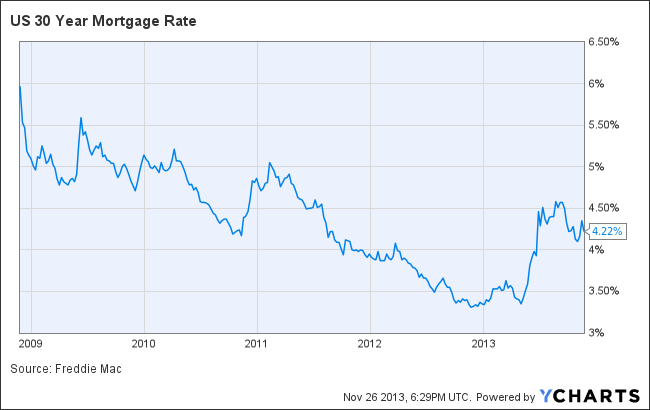 Mortgage Rates Have Been Rising? Where are they Headed? Mortgage interest rates have been on a tear upwards since mid May 2013. It has been said that rates can rise like a rocket but fall like a feather. Rates have certainly shot up in rocket-like-fashion since May. They have since pulled back just a little. Yesterday Ben Bernanke stated the Fed would continue its bond buying program known as quantative easing and that the Fed would not tapper back this program just yet. Maybe the tappering will happen next month or next quarter. The Federal Reserve has had a tremendous impact on bonds and mortgage rates this year. Rates began shooting up in May when Ben Bernanke stated that the Fed may begin tappering their bond buying later this year. So where are rates going from here? Most analysts feel there will be a short term pullback in rates, followed by a longer term trend upwards as the Fed unwinds its quatative easing. Predicting the direction of rates is like predicting the direction of the stock market. The marketplace and the Fed both have tremendous impacts on both markets.